Colonial Racing on the Green! Colonial Downs, is located off I-64 in New Kent, thirty miles east of Richmond. Opened in 1997, It has a one and one quarter mile dirt oval, with a seven and one half furlong turf course. The facility features a glass enclosed, climate controlled grandstand, with seating for 6,000 and an additional 500 in the clubhouse including the Jockey Club Restaurant. The grounds have parking for 4,000 cars and the stables can hold 1,050 horses. Cleverly disguised as a colonial mansion Virginias only venture into pari- mutual wagering Colonial Downs has maintained a high standard from the onset. Previously owned by the Maryland Jockey Club and running as part of the Maryland circuit it is now privately owned an focuses most of its meet on turf racing. It has a purse value index of 24 which is good for a non racino track. 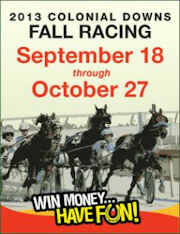 Colonial Downs runs both a thoroughbred and standardbred meet. A unique feature of the harness meet is that the horses start in the one mile and one eight chute on the mile and quarter oval and only go around two turns before the finish. The highlight of the thoroughbred season is the grade II Virginia Derby. Colonial Downs which ceased live racing in 2014, tried to return for 2016 but had their application denied by the State Racing Commission, leaving the future of the track in doubt. There has been a rift between horseman and management over the number of live race days, horseman want more, management less. I did manage to make it to Colonial Downs in October of 1998. That day a horse named Da Hoss made his first start in a 10K allowance race, nearly two years after he won the Breeders Cup Turf in 1986. Needless to say he was an easy winner but the surprising fact came a month later, when with that one prep, was the upset winner of The Breeders Cup Turf for a second time. I recall the track itself to be a state of the art facility, but it was brand new back then.